Disney World Tickets are a major part of the expense of your Walt Disney World Resort Vacation. It is important to know the facts and understand how the tickets work and the structure of the ticket prices. 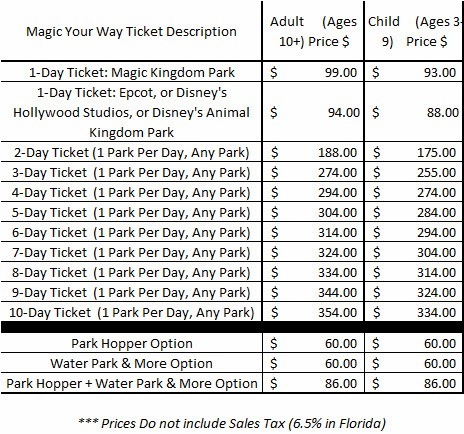 Here you will find up to date 2014 prices for the various Magic Your Way Ticket options and the information you need to help decide what tickets are right for you and your family. Disney rarely offers discounts on theme park tickets, so it is important that you understand how to maximize your value. Walt Disney World Theme Park Tickets are called Magic Your Way Tickets. It is an ala carte system of purchasing the number of days and options you need to suit your particular vacation. The MYW (Magic Your Way) Base Ticket entitles you to visit any one of the four Walt Disney World Resort Theme Parks (Magic Kingdom, Epcot, Disney’s Hollywood Studios, & Disney’s Animal Kingdom ) during each day that you purchase. You will be entitled to unlimited entry and exit to that park during that day’s operating hours. These tickets will expire 14 days after the initial use. Base Ticket Pricing is shown in the table below. You will notice that starting at vacations of 4 days and longer, the per day price goes down dramatically. Prices shown are before tax. Disney World Guests benefit greatly from taking vacations of 4 days and longer. The tiered ticket pricing system is set up to encourage longer stays and reward guests that do so. 1. Park Hopping: This option allows you to visit any and/or all of the four Walt Disney World Resort Theme Parks (magic Kingdom, Epcot, Disney’s Hollywood Studios, & Disney’s Animal Kingdom) during the same day with unlimited entry and exit to those parks during that day’s operating hours. 2. Water Park Fun & More: This option allows you a specific number of visits, from 2 to 10, depending upon the number of Base Ticket days, to the following entertainment or recreation venues in any combination: Disney’s Blizzard Beach water park, Disney’s Typhoon Lagoon water park, DisneyQuest, Disney’s Oak Trail golf course, & Disney’s Wide World of Sports. There are two types of Annual passes available to the general public. They are the regular Annual Pass (AP) and the Premium Annual Pass (PAP). Annual Passes now cost the same for all Disney World Guests ages 3+. The Annual Pass grants the passholder unlimited entry and return to all of the parks on any day, including full Park Hopping privileges. Discounted Tours and Recreational activities. A special AP section of the Disney Website is available only to Passholders to stay current on the most recent news, discounts, and opportunities. From time to time Annual Passholders also receive special Resort Room Discounts and special access to preview new attractions ahead of the general public. The Premium Annual Pass includes all of the above along with unlimited visits to the Disney World Water parks (Typhoon Lagoon & Blizzard Beach), as well as, Disney Quest, Disney’s Wide World of Sports, & Disney’s Oak Trail Golf Course. Once you are familiar with the definitions for the Magic Your Way Tickets and what Options are available, it is time for the MYW Ticket Buying Process. The process is relatively straight forward as depicted above. 1. Choose the number of days for your stay. This will determine the type of base ticket that you will purchase. 2. Decide if you wish to purchase any or all of the 3 options available (Park Hopping, Water Parks & More, & No Expiration). Magic Your Way Tickets are upgradable even after they have been used. If you wish to add additional days or one or more of the Options to your MYW Ticket you may do so by paying the difference between your original ticket and the new upgraded ticket as long as your ticket has not exceeded the 14 day window since initial activation. Stipulations include that you cannot upgrade the number of days on the ticket past 10. You also cannot downgrade to a lower valued ticket to recover used options. If you add the No Expiration Option you must pay the rate for the total number of days on the ticket, not just the remaining days on a used ticket. It is highly recommended to take advantage of this policy and do not add options initially if you are unsure if you need them or not. There is no cost penalty to add them later. MYW Tickets can also be upgraded to Annual Passes. Regular Annual Passes can be upgraded to Premium Annual Passes. Special Note: If you are upgrading tickets that were purchased somewhere other than at the Walt Disney World Resort it is recommended that you use the ticket to enter a park before upgrading. The reason for doing this has to do with Disney upgrading policy. If you upgrade an “unused ticket” the computer scans the ticket to determine its original sales price. If this ticket was sold to a discounter, like AAA, the initial credit that you receive is the price the discounter paid (not what you paid). Then it calculates the difference between that ticket and the new one with the upgrades and you pay the difference. Once the ticket is initially used, the starting “value” of the ticket is calculated at “Gate Price” no matter what it was initial purchase price is. In this case, you pay the difference between gate price and the upgrade price. If you purchased your tickets through Disney as part of a package, most likely you paid gate price and can upgrade at any time without penalty.